If you haven’t heard, Chatbooks are super cute little photo books that are extremely easy to create. You link the app up to your Instagram and Facebook to import anything you post into a book, automatically. You can pull images off your phone or computer as well. The cool part is every time you add 60 pictures, the Chatbooks app automatically prints and ships a 6×6″ little photo album to your door – for only $10, shipped. So cool! You can get your first book in a series absolutely free through my referral link! Get the app here and then tap “Make a Book” to start a series. Use code SNAPHAPPYMEG-PVEV to get your first book free (up to $10 off). The Chatbooks semi-annual sale is coming up this summer! Make your books now and then enter your email below. I’ll be sure to send a deal alert about Chatbooks sales when they tell me about them. 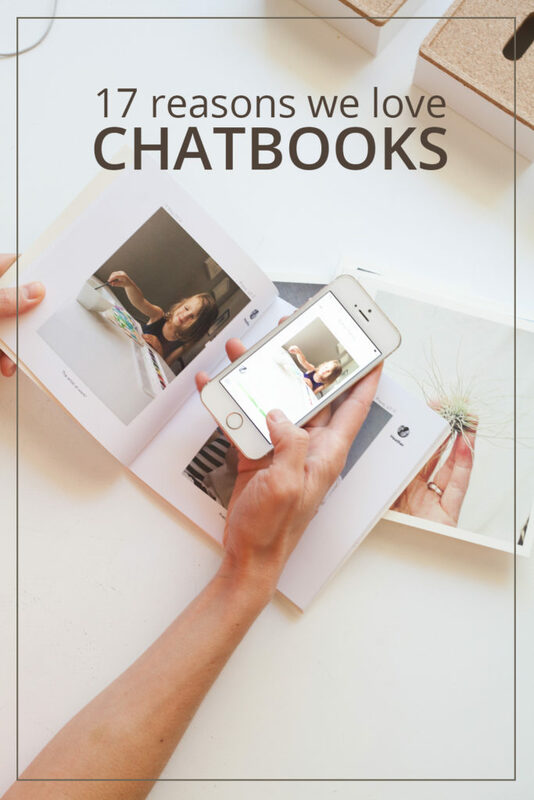 We seriously love Chatbooks at our house – they are so versatile and fun! Not to mention convenient, compact, modern, easy, cheap… and more. 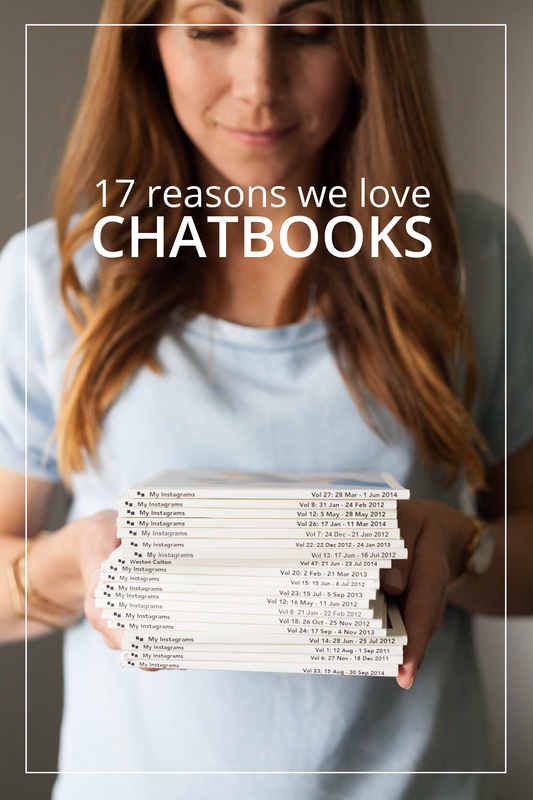 Read on for 17 reasons why people love Chatbooks! 1. You can order your whole series of past Instagram posts easily. When most people find Chatbooks, they want to order their entire series at one time – which can add up quickly! I usually recommend ordering a few at a time until you’re caught up. Definitely consider ordering all your past Instagram feed: it’s so much fun to have a little pile of “family” books! To get started, just download the Chatbooks app, subscribe to your series, and link up to your Instagram. It will pull all your photos into volumes, and you can decide to exclude some or order from there! 2. Chatbooks are the most cost-effective way to make books. One of the things I LOVE about Chatbooks is that they are cost-effective. My kids can love them to death, and it doesn’t make me cringe to think how much that book cost me. If you’ve ever made a photo book, you know you could spend a lot of money going all out on the bells and whistles. I’ve printed large books from other companies, and literally made my kids wash their hands before could touch the book, because I couldn’t bear to get fingerprints on it when it cost so much! Chatbooks are truly for my family – the kids can carry them around, turn the pages, dog ear them, and it doesn’t bother me, because I know I can replace it for dirt cheap. $10 shipped is such a deal! 3. Hashtag Books of Each Kid = Genius! One of my favorite Chatbooks-hacks is to have a hashtag for each of my kids. Then each time I post about them, the image gets automatically uploads in their own book, all about them! It’s a super easy way to track their growth and milestones, and the best part is it doesn’t take any extra work from me to sort through which pictures belong in whose books. As long as I use each child’s hashtag on the post, it will be in their book! Read about how to use a hashtag to create a book here. 4. Get those pics off your phone and onto a place where kids can see them. My kids ADORE looking at pictures of themselves… but if the pics are locked up in Mom’s phone or computer, then they aren’t helping anyone. Too many gems are buried in mom’s phone, so Chatbooks helps me get those pictures off our devices and into our hands, where my children can really enjoy them. I’ll often find them “reading” our Chatbooks to themselves during quiet time, and telling the story of what we are doing in each picture. Adorable, right? 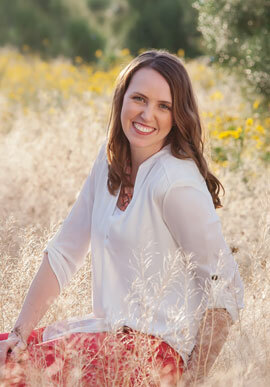 Chatbooks is a huge mom-win for me, because I know my kids and enjoy those memories over and over again. Having physical copies of pictures reminds us all of the wonderful life we live! The fact that you can basically make photobooks with zero effort is the clincher. Grab the app and get started today! I’m in the process of making a Chatbooks series of the kid-art we have in the house. The paper clutter can be totally overwhelming, and I love that I can just snap a photo of the picture my kids drew and it will end up in a cute little book of all their art. It’s super easy to do this with the hashtag function! This helps me save only my very favorite pieces of art, and memorialize the rest without the clutter or bulk. 6. Chatbooks are perfect for small hands and small houses. I think Chatbooks are the perfect size – 6 by 6 inches square! The series books of 60 images are about a quarter inch thick – easy and light for little people to enjoy. This also means I can display and store a lot of pictures in a small amount of space! The length of custom books obviously depends on how many pages you choose, but I love that all my Chatbooks fit together in a tidy stack, easily displayed on a shelf or in a basket. 7. Ordering a copy of your Chatbooks is a no-brainer Grandparent Gift! We double subscribed to our series, and mail one to the Grandparents. It’s a no-brainer way to give them a physical memory of their family members. I believe my mom uses hers as a “brag book” for her purse, to show off her cute grandchildren… and I can’t blame her! All you do is go to your subscription online and click order again, and put in the new address. Voila! Every time you get a book, the grandparents will too. 8. It’s super easy to add contributors to make a book together. Do you and your husband both post pictures of your kids? Easy! If you are both on the series, then both of your pictures will be included in your books! Adding a contributor is a one-time effort, and then both of your pictures will show up in your book. 9. Did you have a big family vacation or wedding? Filter By Hashtag rocks! It’s REALLY easy to make joint-effort books – no more crazy google drives and endless emailing to get pictures from a family function. If you have everyone at your family function using the same hashtag, you can really easily make a group book together. Just start a new series, add your family as contributors, and then filter by hashtag. It’s super great for family reunions, weddings, or cousin books where several people are using the same hashtag but you want access to everyone’s photos! 10. It’s easy to exclude pictures if you don’t want them in your book. Raise your hand if you ever repost something just to enter a contest? Or maybe you over-grammed and now you’re regretting it. It’s easy-peasy to exclude any photos from your book, even if they are already uploaded into your feed. entries, etc. Just select the pictures and then hit exclude. I do this all the time for business posts that I don’t need in my family books. 11. Chatbooks make excellent quiet books for kids. If you need a quiet book for your diaper bag or church, Chatbooks has you covered. You can easily gather together a pic of each of the family members to make a “family face book” for littles, or upload royalty-free images of church activities and temples. It’s light and tiny for your diaper bag, and if it gets ripped or chewed on, no biggie. 12. Captions are automatically imported – and they are editable! Having captions and dates in your photobooks is one of the keys to a good family memory system – ten years from now are you going to remember the names of the kids next door? Or why you took every picture? Probably not…having captions is key! It can take forever to write out all those captions in regular photo books though – but Chatbooks automatically pulls your instagram or facebook caption and includes it in your book. About 3 lines of text fits under each photo in Chatbooks. Anything over 300 characters just populates onto the next page (instead of a photo on that page.) And the best part – you can edit any caption before you approve your books. So you can add more details if you want, or shorten a long one that doesn’t matter as much. 13. Catch-up posters rejoice: You can easily change photo order! Catch up posts are just a fact of life these days. Buy you can make your photos show up in whatever order you choose! Get those posts back in chronological order, with ability to drag-and-drop rearrange the order of photos in your book. 14. Prefer hardcover books? You can do that! For a special book, I’m totally willing to pay more for the hardcover version of my Chatbooks. It’s great for books that you gift to someone, or mom’s version of the ongoing series (you know, the one kept on the high shelf?) At only $5 more a book, it still makes a 60-page book come in at less than $15. 15. Photo-A-Day Projects make so much sense in Chatbooks. Photo-A-Day Projects are fantastic ways to grow and improve your skills – but they are a bit of a conundrum to display. Chatbooks make perfect sense to assemble and display your Project365 or other project in one, compact book. Plus, having it in a book makes it easier to share and show off your cute pictures. The Custom Books are intended for projects just like this – they go up to 366 pages (one for each day, even on leap year!). Just start a new custom book and add all your photos – pricing depends on how many you add. 16. End of the Year Highlight Books are automatically created! Come the end of the year, Chatbooks has an AUTOMATIC function that gathers together your most-liked pictures you’ve posted from the year, and puts them in one book. It’s like a highlights reel of your best family moments – except you didn’t have to spend the time gathering those together. I love this function and happily display our yearly highlight books! 17. And finally… Chatbooks offers quality comic relief. Watch this video. Even better if you watch it with your own kids… they’ll be giggling in no time. Have I proved my point yet? We seriously #LoveChatbooks over here. Click here from your phone to download the app. Click here from your computer to start an account on a desktop browser (good for connecting to Google Photos or uploading large batches). If you’re just getting started with Chatbooks, then all you need to do is go download the app to get started. You’ll link it up to your social media accounts or camera roll. Choose to start a series (perfect for Instagram/Facebook) or a custom book (this is how you do more than 30 pages for a specific event or hashtag). A general introduction to Chatbooks is on this post, and more information about Chatbooks features is on this post. The app is pretty self-explanatory, but let me know if you have any questions at all! This is the first I’ve heard of Chatbooks, but it sounds like the best idea ever! We have so many pictures on social media and in our phones that never get looked at. I’m downloading the app tonight! It really is a genius idea! I know you’re going to love the app! Whaaaaaaa????!!!! I’ve never ever heard of these and didn’t even know it existed. These look much better than the struggle photo album attempts that I do. And more organized too! Thanks for sharing and putting me on to these!!! I’ve heard about apps such as this, but have never taken the time to surf the interwebs for one so I appreciate the review and many ways to take full advantage of their fabulously priced photo books! Do the pages come perforated in case you want to take a picture out of the book? No, they are intended to stay bound together as photo books. If you want a stand alone picture, just print it!